The Limerick Association of London honoured the Centenary of the Armistice with dignity on Sunday last at a special ceremony in Kensal Green Cemetery, London attended by members and friends and visiting guests from Ireland. – Pictured at the graveside of Mrs Catherine Hayes Bushnell. The Limerick Association of London honoured the Centenary of the Armistice with dignity on Sunday last at a special ceremony in Kensal Green Cemetery, London attended by members and friends and visiting guests from Ireland. The Commemoration Service was delivered by Fr Michael O’Connor, P.P. of the Sacred Heart Church, Kilburn and native of Ballyhahill, Co. Limerick and we paid tribute to great iconic Limerick people laid to rest in London, the legendary Limerick Gael and hurler Seán Og Hanley from Kilfinane and also to renowned Opera Diva singer Mrs Catherine Hayes Bushnell from Patrick Street, Limerick. 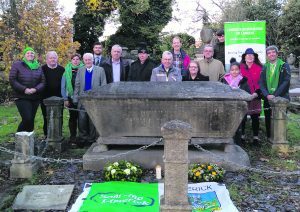 The commemoration commenced at the graveside of Seán Og Hanley where a biography of his life was delivered by the Limerick Association of London. Seán Og was a member of the victorious Kilfinane hurling team of 1897 which brought the first All Ireland senior hurling title to Limerick emerging victorious over Tullroan from Kilkenny on a 3-4 to 2-4 scoreline. Shortly afterwards Seán Og emigrated to London where he pursued his love of Gaelic games and was a member of the victorious London senior hurling team that were All Ireland senior champions in 1901. Bad health brought a very premature ending to his life and he died in London in 1915 at the tender age of 38. 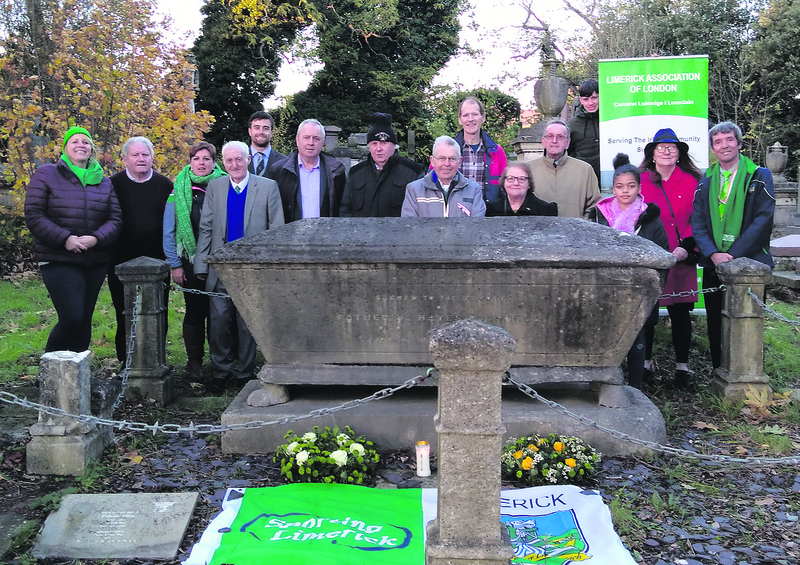 The London GAA community rallied to have Seán Og laid to rest in St Mary’s Catholic Cemetery in Kensal Green and in 1958 the Limerick Association of London took over the care of his grave and continue to do so to the present day. It is truly fitting that this ceremony marked many historic dates as firstly it marked the 100th anniversary of Limerick’s second All Ireland senior hurling title in 1918, the 60th anniversary of the Limerick Association of London management of the grave and of course 2018, the year where Limerick senior hurlers bridged a 45 year gap to bring the Liam McCarthy Cup back to the Treaty County. Our ceremony featured wreath laying from representatives of the Limerick Association, the Kilfinane community in Limerick and the Council of Irish County Associa-tions London. The service concluded with prayers and a grave-side blessing followed by a passionate rendition of ‘Limerick You’re a Lady’. The attendance then immediately proceeded to the grave of Catherine Hayes, a native of Patrick Street, Limerick, who rose to international fame with her talented and iconic opera singing. Catherine Hayes was born in Limerick in 1818 and in her early years her musical potential was recognised by the Dean of St Mary’s Cathedral where efforts were successfully accom-plished to allow Catherine to train and study before embarking on her distinguished musical career. Catherine Hayes performed in many of the great opera houses of the world, the Scala in Milan, The Royal Opera House in London and even performed for Queen Victoria in Buckingham Palace to an audience of 500 guests. Her operatic career brought her on tour of Europe, Asia, Australia, New Zealand and to the United States, and she brought great joy to her audiences. On her return to England in 1857 she married William Avery Bushnell in St George’s Church, Hanover Square, London in 1857. Her beloved William died of ill health in France in July 1858. Catherine died on 11th August 1861 in her 43rd year and was buried in Kensal Green Cemetery, London on 17th August 1861. Her grave has been carefully maintained by the friends of Kensal Green cemetery, London and the Limerick Civic Trust, Limerick, Ireland. The graveside commemor-ation for Catherine Hayes commenced with a biography of her life followed by prayers by Fr Michael O’Connor. This was preceded by wreath laying on behalf of the Limerick Association London by a young Ms Cathy Hayes from London and afterwards a wreath was laid by Felix Pery, Viscount of Limerick on behalf of the Limerick Civic Trust, Ireland. Further candles were lit and placed at the graveside by representatives of the Council of Irish County Associations London and the Limerick Association of London and our ceremony was completed by the recitation of a poem by Mrs Claire Sturley, London and followed by a prayer for the deceased, and for all those involved in the creation of music. It was truly fitting to mark the 200th anniversary of the birth of Catherine Hayes in this special service, and sincere thanks to all who attended and played their part in making this fitting tribute so poignant. Our ceremony was preceded by a reception at the Mazenod Social Club in Kilburn where friends and supporters and guests enjoyed the excellent hospitality of the club and the Limerick Association of London.